For those who don’t know, a “fougère” (which means “fern” in French) is a type of masculine fragrance that is based on a mixture of three ingredients: lavender, coumarin, and oakmoss. The fougère is the most common type of men’s fragrance, and is the most classic. In its purest form, it smells sharp, clean, dry and semi-sweet – the lavender provides sharpness and a clean smell, the coumarin gives a vanillic but dry sweetness, and oakmoss provides body, fullness and a green hue to the scent. Often when guys talk about barbershop scents, they’re talking about fougères. To give you an idea of what a fougère smells like, two very well known fougères are Brut and Pinaud’s Clubman, which are both inexpensive and available in any drugstore. Canoe is another archetypal fougère. Talk about a classic – Canoe has that warm, talcum powdery barbershop smell that always smells relevant, no matter what year or decade it is. Canoe’s greatest qualities are warmth and balance. When I wear Canoe, everything feels just right – sweet, but warm and comfortable, not cloyingly sugary. That’s because the coumarin, which provides most of Canoe’s sweetness, is kept at bay by the lavender and oakmoss, which serve as perfect counterbalances to the sweetness. 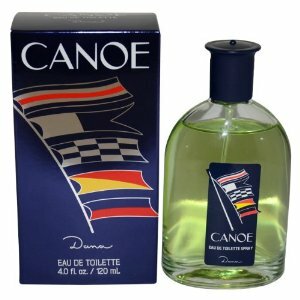 Canoe may not be an exciting fragrance, but it sure is comfortable to wear. As you might have guessed, Canoe’s biggest flaw is its spare plainness. It really does follow “The Fougère Recipe Book” to the letter, and that can make it a little dull to wear after a few hours. I really like wearing Canoe, but even I have to admit that after a couple of hours I usually start wishing I had put on something more interesting earlier in the day. On the other hand, Canoe is not supposed to be this loud, blaring powerhouse anyway. It’s supposed to be restrained and discreet, unlike, say, Brut. Brut is a fougère for a superhero. By contrast, Canoe is quietly unassuming, for a secure man who doesn't always have be the center of attention. Canoe is something I often use when just lounging around the house as, like you say, what it lacks in interest it makes up for with the comfort-factor.